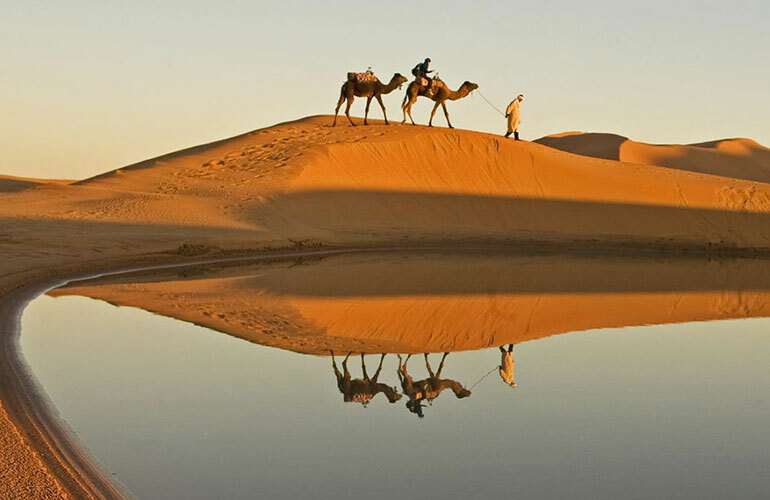 2 days desert tour from Marrakech | Private Marrakech to zagora tour. 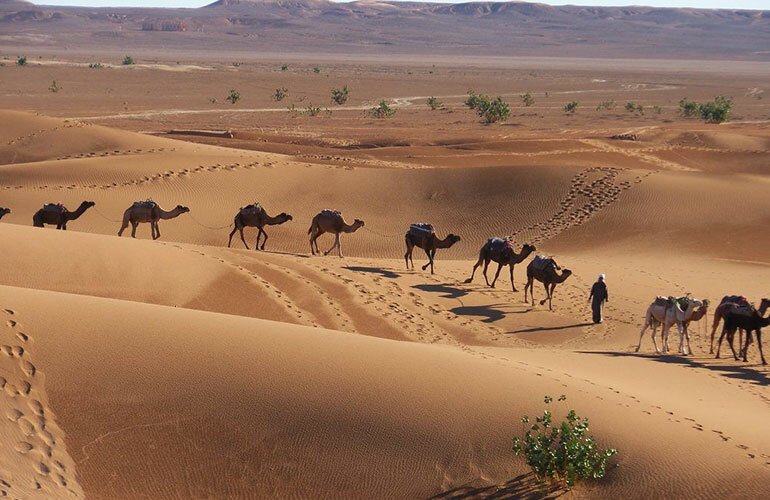 If time is of the essence and you yearn to explore the Sahara Desert, then this 2 days desert tour from Marrakech to Zagora will give you the perfect opportunity to glimpse just a little of the Morocco Sahara Desert for yourself. You must be thinking that you’ll spend quite some time driving. Indeed, there will be some traveling to do (7-hours each way). However, it will definitely be worthwhile. Besides, Morocco is known for being home to hauntingly beautiful landscapes. So, we’re sure that you’re going to enjoy your stay. The scenery is unbelievable. As a result, you wouldn’t want to leave. 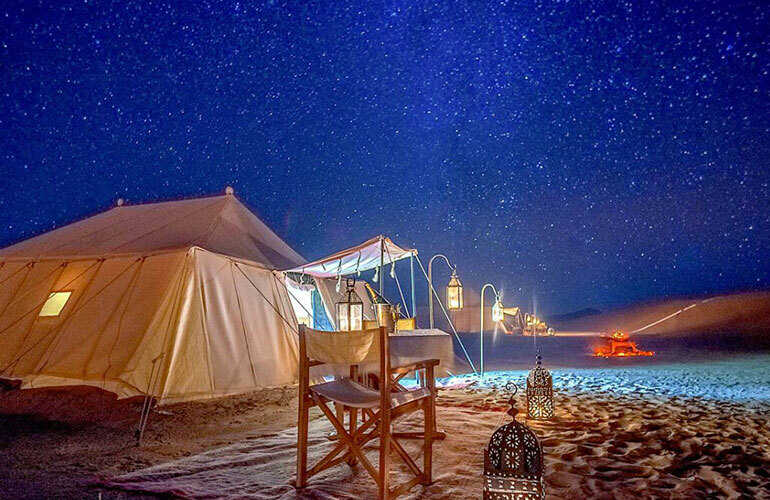 We’ll go trekking together across the desert on camels and we’ll spend an unforgettable night under the stars at our secluded Sahara Desert camp. In addition, you will have the opportunity to taste mouth-watering Moroccan food. Sharing the experience of visiting Kasbah Ait Ben Haddou, a UNESCO World Heritage-listed site, the fortified village also known as a “ksar” with its simply amazing Kasbahs. This ksar has been used by movie producers as a backdrop for many blockbuster epics since the 1960s. You’ll sleep underneath the starry night sky, and wake up wondering if you’re dreaming! 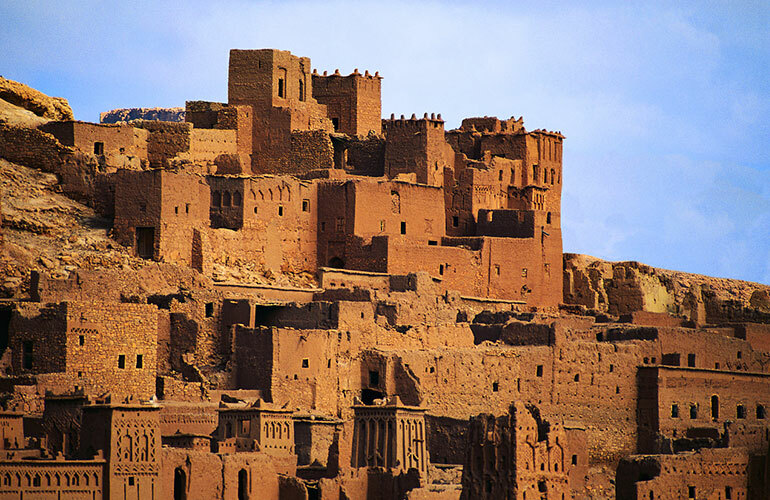 Together we’ll journey to the Berber town of Ouarzazate and we’ll explore the magnificently restored Taourirt Kasbah. 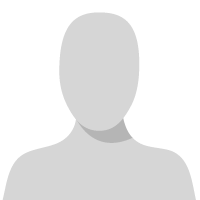 Your experienced local tour guide will pick you up from your Marrakesh hotel or riad at 7.30am in the morning. After that, you should be ready to begin your 2 days desert tour from Marrakech to Zagora, via the Tizi-n-Tichka Pass. We’ll pass through many Berber villages on the way, and we’ll enjoy a visit to Kasbah Air Ben Haddou, a World Heritage-listed site which has been used as a backdrop for various Hollywood blockbuster movies such as Lawrence of Arabia and Gladiator. Have a great time in Ouarzazate. We’ll stop for a leisurely lunch in Ouarzazate, then carry on with our tour past the Anti-Atlas Mountains and visit the Berber village of Agdez. Then we’ll also travel through Draa Valley and marvel at the thousands of Date Palms offering their welcome shade. 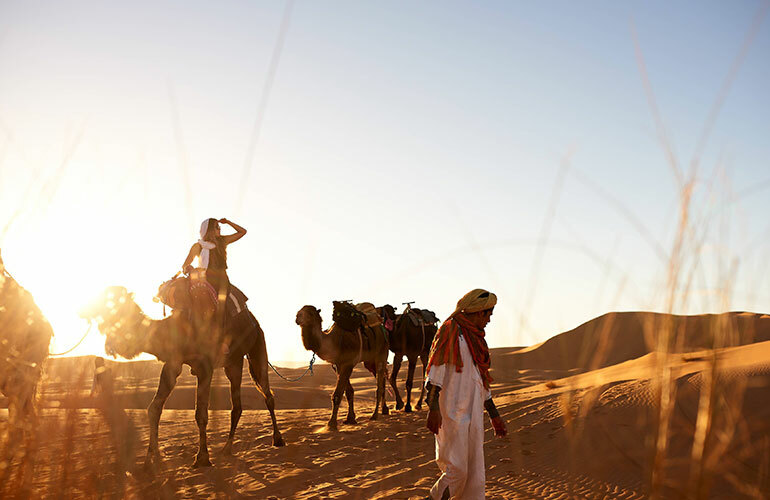 Enjoy camel trek over the sand dunes. 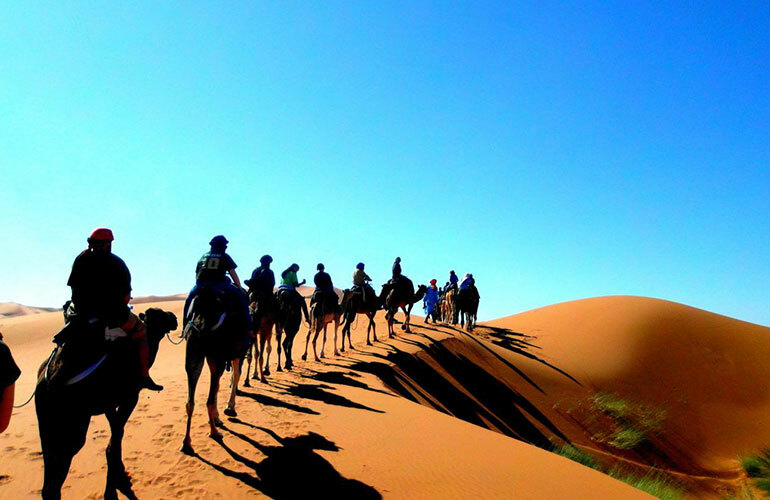 In the afternoon we’ll enjoy a camel trek together over the sand dunes. Subsequently, you will experience the most spectacular sunset of your life. After that, you will hop back on a camel. And head to our secluded Sahara Desert camp. There, You’ll enjoy a delicious Moroccan dinner while being entertained by local nomads, serenading us with their drums. We’ll enjoy a wonderful evening of fun and entertainment together under the clear, starry sky. First, a leisurely and memorable Moroccan breakfast. Then, you will enjoy another camel ride to experience sunrise over the sand dunes of Zagora. We’ll depart for Ouarzazate where we’ll visit Tifoultout Kasbah and rest for lunch. In the afternoon we’ll begin our journey back to Marrakesh. Finally, your 2 days desert tour from Marrakech will be over when your guide takes you back to your hotel or riad in Marrakesh. Living a great adventure when you stay at our secluded Sahara Desert camp in Zagora will be in a private tent, at our secluded Sahara Desert camp in Zagora will be in a private tent, with shared showers and bathrooms. Please note that your evening meal and breakfast are included in this tour. If you prefer to upgrade to a deluxe camp with a private ensuite, an additional cost of €59 per person will apply. This request should be made at the time of booking your tour. Our driver will deliver you back to your hotel in Marrakech, or alternatively, to the closest accessible location to your riad in Marrakech.